A reporter returns to the wheel after many years and finds much has changed. Cabbies are often cheated, and danger lurks at every turn. This story was reported by the Globe Spotlight Team, reporters Bob Hohler, Marcella Bombardieri, Jonathan Saltzman and editor Thomas Farragher. It was written by Hohler and Farragher. The crime-scene photos loop like a stubborn nightmare in a hushed classroom at a Boston police station in Charlestown. There is blood — a cabbie’s blood, spattered about the interior of the Boston taxi he operated until early one morning in March 2012. The cabbie’s fate is a mystery to the 20 men who sit shoulder to shoulder before the projection board. Most are immigrants, refugees, masters of many tongues, none of them English. It is opening night of the Boston police hackney carriage driver training class. Each gaze is fixed on the flickering crime-scene images: a bleak corner of the South End where the cabbie, a 51-year-old married ­father, was stabbed nine times, stripped of his night’s earnings, and left for dead. The men have waited months for a chance to become taxi drivers. They will spend five nights training for a licensing exam. And if they pass — many fail because of their limited English — they will learn the rest, in the garages and on the streets, the hard way. As a Globe reporter discovered over eight nights as a ­licensed Boston cabbie and throughout a nine-month Spotlight Team investigation, the city’s newest taxi drivers join thousands already navigating through two Bostons: a luminous city of gleaming towers and vast opportunity whose workers and visitors they shuttle about daily, and the city’s struggling underclass, of which most of them are a part. Laboring 12 to 24 hours a day as independent contractors, without job protections or benefits, they will endure shifts of public service and private indignities, outsized risk and systemic exploitation. Many will be cheated by their taxi owners and customers. They will confront hazards more potent than potholes: violent crime, distracted and impaired drivers, and their own debilitating fatigue. Globe reporter Bob Hohler encountered drunken passengers, gridlock, overcharging, and city drivers. At 3 a.m., in the grip of winter at the taxi pool at Logan International Airport, Boston’s newest cabbies will find overworked drivers asleep in their cabs, two hours after the last incoming flight and two hours before the morning’s first arrival. They will see faces of discouragement: Some drivers have come to believe supporting themselves requires turning the taxis they lease into their homes. Among those waiting for work in the predawn gloaming is a 36-year-old Moroccan immigrant who worries about providing for himself and his diabetic wife, pregnant with their second child. Two years ago, Said Elqanoun was diagnosed with acute renal failure. Independent contractors have no sick leave. So between his four-hour dialysis treatments, which he receives three days a week, Elqanoun drives on. After 13 years as a Boston cabdriver, earning about $30,000 a year before taxes, he remains so financially distressed that he has accepted government aid — health care, food stamps, and some disability funds — as a US citizen. Larry Herman, civilian police employee and former cabbie who teaches the Boston Police Department’s hackney carriage driver training class. What he urgently needs now is a new kidney. And while he endures a long wait for a donor, Elqanoun often begins his work days at 4 a.m., napping at Logan before the morning’s first flight. Most of the students in the training class are Haitians, Moroccans, Somalis, and Eastern Europeans. Some have waited nine months to begin training because of the high demand for Boston hackney licenses among immigrants who lack the language skills to qualify for many jobs but night cleaner, busboy, or dishwasher. Only two class members speak with American accents: a retired Boston police officer and a Spotlight Team reporter. The former cop wants extra income. The reporter wants a driver’s side view of Boston’s taxi industry. Before his stint behind the wheel ends, the reporter will see what it means to be cheated by a taxi company and his ­passengers. And he will survive a harrowing crash — a ­not-uncommon occupational hazard — after a motorist runs a red light near Copley Square. The collision will send the reporter and his passengers to the hospital and destroy the taxicab. Hohler, who drove a cab during his college years in the 1970s, acquired a hackney license again and drove eight shifts. For 20 hours over the five nights, instructor Larry Herman, a civilian police employee and former cabbie, encouraged such kindness as he worked to mold his students into professional drivers. Boston needs good-will ambassadors, Herman told them, not cellphone chatterers who mistreat some customers and make romantic advances on others. “Your cab is not a dating bar,’’ he said. The city, he said, can do without the kind of belligerent cabbies who settle disputes with unhappy customers by dumping them on the Zakim Bridge and in the Sumner Tunnel. Cabbies also have rights, he said. They are recorded in an 80-page police handbook and embodied in his lessons. But many students who pass the 75-question exam will discover that the manual’s dense regulations and the instructor’s blunt words offer little protection against the industry’s hidden dangers, especially the high-handed tactics of some cab fleet owners — owners who, as the Spotlight Team found, in some cases regularly exploit drivers in small ways and large. Herman, in fact, acknowledges this dark side of the trade, especially for newcomers like the students in his classroom. It is a punishing dynamic that takes a toll on consumers, too. A cabbie who feels oppressed is unlikely to be lighthearted behind the wheel. “When there’s no justice, you have to be [angry],’’ said taxi driver Jaafar Mohamed, a native Moroccan who said cab owners are routinely overcharging their drivers. Students who pass the test in Charlestown pick up their licenses at police headquarters, then select their first destination as a taxi driver. Many, like the Globe reporter, head directly to a gloomy garage on Kilmarnock Street, headquarters of Boston Cab. Because there are more than 6,200 licensed cabbies in the city and only 1,825 licensed taxis, finding a cab to rent can be challenging. That daunting math makes Boston Cab popular for new drivers. With 372 cars, it is by far the city’s largest fleet. 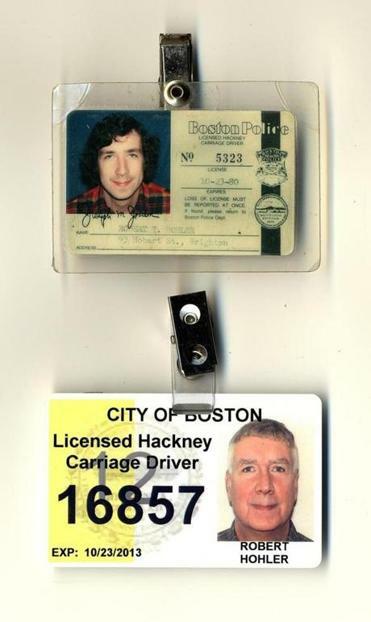 In the company’s basement garage in the Fenway, the reporter flashes his freshly laminated license and is sent to the Registry of Motor Vehicles for a copy of his driving record. He returns that Friday, driving record in hand, and receives a terse instruction. “Come back at 9 o’clock Wednesday with $500 cash,’’ a garage manager says without explanation. To drive for Boston Cab, a Globe reporter had to go through orientation, provide a copy of his driving record, and pay a $500 security deposit. Two other men — a Jamaican and a Moroccan — are waiting Wednesday with their $500. They are ushered into an orientation class, where an instructor takes their money — security deposits, he says — and hands them receipts. It is the only receipt the Globe reporter will see in eight nights driving for Boston Cab — a violation of police regulations. Without a receipt for his nightly lease payments, a driver finds himself defenseless if management accuses him of owing additional money. The class takes place in a room for drivers next to the dispatch office and the money room. The drivers’ area is dank, the walls cluttered with a flat-screen television, an array of cheap art prints, and an advertisement for an immigration lawyer. There are two arcade video games, a soda machine, and a couple of Muslim prayer rugs. The orientation is brief. Three issues are underlined. Students first must prove they can fill out an accident report. They are warned never to return from a shift with empty gas tanks. “That’s the one that upsets the boss,’’ the instructor says, a reference to the company’s multimillionaire owner, Edward J. Tutunjian. Against the money room’s back wall is a bunker built of concrete and steel with a drop-box chute for drivers to deposit their payments in zippered plastic pouches after their shifts. The chute can be a black hole for cabbies. With no cashiers to process their payments, Boston Cab drivers go home without assurances they have met the company’s obligations. New drivers are told nothing about the city requirement that they get immediate receipts. No instruction on how to contest bogus overcharges by management. No word at all about drivers’ rights. The instructor, who later is seen collecting “gratuities’’ from drivers as he distributes car keys, completes his orientation and hands his students off to a computer dispatch supervisor. As the supervisor speaks, two Muslim drivers enter the room, lay down the prayer rugs, and fall to their knees, facing toward Mecca — a common sight at Boston Cab and the airport taxi pool. Several other drivers drift in, complaining that computer and meter system crashes have led to a wage-less shift. “It has been a terrible problem,’’ the supervisor confirms. When asked about police rules that require medallion owners to reimburse them $8 an hour if they lose more than an hour to such problems, the cabbies shrug in resignation. A lost cause. They seldom complain out of fear of losing their hard-won livelihood. The reason for that fear was made plain when the Globe saw a manager threaten to deny the keys to a cabbie over a disputed payment. When the driver protested, the manager issued an ultimatum familiar to many cabbies. The driver stepped back, helpless. He had reached a dead end. For years, Boston taxi passengers have complained about substandard service: circuitous routes, reckless driving, refused fares, boorish behavior. And, indeed, the Globe found, despite the Police Department’s broad authority to deny licenses to individuals they deem unsuitable, some Boston cabdrivers have questionable pedigrees. Ahmed Mehalba, for instance. Mehalba was arrested by the FBI at Logan Airport in 2003 after he returned from Egypt with classified US documents he obtained as a civilian translator at the Guantanamo Bay detention center. A native Egyptian and US citizen whose uncle was an Egyptian military intelligence officer, Mehalba pleaded guilty to illegally possessing the documents and lying to law enforcement. He was sentenced to 20 months in prison. Dozens of cabs lined up at the Logan taxi pool, where they wait in a queue for an electronic signal telling them to head to the airport terminals to pick up passengers. He is now permitted to pick up taxi fares at the airport where he was arrested. Mehalba said in an interview that, while he has retained his Boston hackney license, he switched last year from driving taxis to participating in the livery, or public limousine, business. Livery drivers are not subject to criminal background checks because the city and state do not fully regulate that industry. The police hackney unit insists its annual background checks of licensed cabbies weed out most bad apples. Hackney police say they have stepped up their enforcement since the 1990s, when they licensed three men who drove Boston Cab taxis and later were found to have ties to terrorism. And while few drivers would argue that today’s taxi fleet is driven by an angelic workforce, they say the industry’s biggest perils lie not in the person behind the wheel but in its out-of-balance economic model and one-sided enforcement that consistently favors medallion owners. A typical cabdriver handles about 25 fares over 12 hours. At Boston Cab, drivers begin shifts needing to earn about $106, not including gas, to break even — a threshold that can take five or six hours to reach. On the worst days, when fares are rare, the driver finishes in the red. That means drivers, particularly new drivers unfamiliar with the business, need to “drive like nuts,’’ said veteran cabbie Jacques Tagher. Measurements of cabbies’ income vary greatly depending on who’s doing the measuring. Oleg Uritsky, a medallion owner chosen by the city’s taxi fleets to serve as their spokesman, told the Globe that some drivers can earn as much as $50,000 a year. However, one driver Uritsky cited as a top earner said in an interview that he needed to work about 80 hours a week to earn that much. The US Bureau of Labor Statistics puts an average Boston cabbie’s income at $27,000. The Police Department’s own estimate, based on meter and credit card data, is slightly higher than that. He declined to disclose his income but said on an especially good night he can make $500. Tilles, who like the recently licensed Globe reporter is white, said the ability to skillfully navigate city streets and grasp the daily rhythms of the business, not cultural or racial factors, are the chief ingredients in determining a driver’s income. But at the Logan taxi pool, where hundreds of cabs queue up at a remote parking lot waiting for an electronic signal to head to the terminals, that opinion is not widely shared. Drivers, many of them recent immigrants who said they struggle to earn a living wage, reserved most of their discontent for the hackney unit that polices the industry. Were hackney police protecting their interests, many cabbies said, they not only would root out misconduct by medallion owners but curb the siphoning of their business by gypsy cabs, livery cars, and out-of-town taxis making illegal pickups throughout the city. Why do they do it? Many drivers have identical answers: Look at the economy. “It’s a horrible job,’’ said Bernie Allen, a native of Great Britain who intends to retire from driving this year. Allen, a champion marathoner, a holder of multiple patents, and a onetime organic chemist, has been robbed four times, most recently late last year. He is eager to put the business in his rearview mirror. “They totally exploit the workers,’’ Allen said. As an ironic tribute to a business he has come to loathe, Allen has devised a board game loosely modeled on Monopoly. There are iconic game pieces and cards that spell out windfalls and financial collapse. “Accident in Big Dig. Lose $10,’’ one game card reads. Instead of claiming title to gold-plated real estate like Boardwalk or Park Place, the object of “TaxZee,’’ Allen explained, is to become the next Eddie Tutunjian. On his first day of work, the Globe reporter approaches the window to add his name to the waiting list for the night shift. It is nearly 3 p.m., when cabs start to become available. More than a dozen men jockey for position, the newcomer getting outflanked as the list grows. “You have to be more aggressive,’’ one cabbie tells him. Boston Cab drivers wait at the window at the Kilmarnock Street garage to get keys to a cab. Two others offer advice: You need to tip, or bribe, the dispatcher to get a better cab faster. Instead, the reporter declines and waits two hours to begin his shift. Tutunjian himself often is seated at a desk in the dispatch office as his employees hand out keys to his taxis. A man whose own road to riches began as a cabdriver, Tutunjian no longer has much in common with the drivers beyond the window. He quietly commands his empire as clusters of cabbies wait for keys, trading stories of a job that all too often leaves them feeling run over. The Globe reporter, finally behind the wheel, later will see some of those drivers sleeping at the airport as they try to cover the costs — some of them improper — of doing business with Boston Cab. Since Jan. 1, for instance, Boston Cab has defied a police order barring medallion owners from charging drivers a premium fee for model year 2009 taxis. Under city regulations, drivers may be assessed the surcharge — $18 per shift, or $170 for a weekly rental — only for vehicles less than five years old. Boston police distributed a notice to fleet owners in January reminding them they no longer were permitted to charge the fee for 2009 models. Yet when the Globe asked more than 20 drivers how much they have been charged weekly since Jan. 1 to rent 2009 Toyota Camrys from Boston Cab, each said the price has included the $170 premium fee — a violation of police rules that over the first 13 weeks of the year cost each driver more than $2,200. The drivers said they feared losing their jobs if they protested. Boston Cab owns at least 75 2009 Camrys, which means the company could have reaped more than $165,000 since Jan. 1 through improper surcharges. Yet the police have not stopped Boston Cab or USA Taxi in Dorchester, which also has charged the premium rate for its nine 2009 hybrid Ford Escapes since Jan. 1. USA’s owner, George Summers, showed the Globe records that he bought the vehicles between April and June 2009. “My position is, I should be entitled to charge the $18 for the full four years after I bought the cars,’’ Summers said. Asked about the city’s failure to protect drivers from the overcharges, Mark Cohen, the police licensing director who oversees the hackney unit, cited the written notice his staff distributed to fleet owners. “We were proactive,’’ he said. Beyond that, Cohen challenged the Globe to deliver the police a victim. “Why don’t you bring us one?’’ he said. Arthur Rose, a drivers’ union activist who began driving a Boston taxi in the 1970s after he returned from the Vietnam War, said Cohen issued a similar challenge to him when he complained in February about rampant overcharging in the industry. Rose said cabbies are fed up with Cohen asking them to bring him victims rather than directing hackney police to investigate their allegations. The day after Cohen issued his challenge to the Globe, the hackney unit’s history of lax oversight came into sharper relief when the State Police acted on allegations of corruption in the Boston taxi industry. On Feb. 12, State Police arrested five taxi controllers at Logan Airport on charges they took bribes from cabdrivers they were responsible for regulating. Why, Rose wondered, did Cohen and the Boston hackney police not launch similar investigations in the city’s taxi garages? Before Rose stopped cab driving last month to receive treatment for an illness possibly related to his military service, he worked seven days a week, 12 hours a day, and made, by his accounting, about $24,000 a year. In his last 18 months as a Boston cabbie, he rented a taxi by the week from Yefim Teperman, whose son, Semyon, went to prison in 2006 for racketeering and money laundering in connection with bribing of a Boston police hackney clerk. Rose said Teperman overcharged him $90 a week in part by requiring him to pay weekly radio dispatch dues out of his pocket — a violation of city regulations — to the Independent Taxi Owners Association. Rose accepted Teperman’s excesses, he said, because his union activism had gotten him blackballed from other cab companies. But he finally decided to fight back, he said, ­after Cohen’s latest challenge to produce a victim. Cohen, through a police spokeswoman, denied making the statement to Rose. And Teperman did not respond to the Globe’s requests to address Rose’s allegation. For decades, many Boston cabbies drove rattletraps one breakdown shy of the junkyard. Today, the fleet sparkles — late-model cars patrolling a more robust city, where new fare opportunities abound from the suddenly bustling Seaport District to redeveloped neighborhoods from Jamaica Plain to Charlestown. But driver safety remains a concern. Although a Boston cabbie has not been killed since the 1990s, when five were slain on the job, the city’s taxi drivers continue to die and suffer crippling injuries in road crashes. Drivers passed time in Logan’s taxi pool playing dominos. They line up hours before the first and last flights. Two Boston cabbies and a passenger have been killed since 2007 in separate accidents in Somerville. In 2005, a Boston taxi driver died when he was struck by a motorist while he was trying to help a cabbie whose taxi had broken down on the Massachusetts Avenue bridge. Two other cabdrivers lost their legs when careless colleagues lost control of their taxis in the loading lanes at Logan. While none of those incidents was directly attributed to driver fatigue, the issue is a daily concern for industry activists. 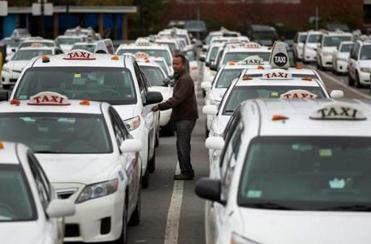 Boston police allow cabbies to rent taxis for 24-hour periods, known as iron shifts, which can test a driver’s stamina. In a 2012 poll of transportation workers by the National Sleep Foundation, 7 percent of taxi, limousine, and bus drivers said they had committed a serious error because of fatigue. Three percent said they had been involved in accidents because of it. Ramon Calvo, who drives a Brookline cab after his Boston license was suspended last year over an alleged credit card violation, knows the feeling. He said that as a Boston cabbie he occasionally veered off the road with passengers while dozing at the wheel. “Fortunately, I woke up a lot of times just before I got in an accident,’’ he said. Other times, Calvo said, he fell asleep at red lights. The Globe reporter, who had previously worked as a cabbie during his college years, is familiar with fatigue as an occupational hazard when he slips behind the wheel of one of Boston Cab’s Camry hybrids. He knows the industry’s unforgiving economics: making money means hustling, squeezing every nickel out of a shift. He works no more than 12 hours a night, including the wait for a taxi. Boston Cab charges him the standard shift rate of $77, plus an $18 premium for a newer cab, as well as a city-sanctioned, 30-cent parking violation fee. Factor in the sales tax ($5.96) and optional collision damage waiver ($5), and his cost per shift is $106.26, not including gas. Over eight nights, the Globe cabbie takes home about $965, or about $11.35 an hour, before taxes. On Halloween night, six female medical students squeeze into his cab on Mission Hill. Dressed as the 2012 US Olympic women’s gymnastics team, they’re bound for Lansdowne Street. There are moments of catharsis: A woman, on her way home to Cambridge, has just received word from her doctors at Beth Israel Deaconess Medical Center that she is near death. From the back seat, she reflects on her life, expresses concern about her children, and looks forward to cuddling with her dog. She seems to draw a measure of comfort from her exchange with a stranger. And there are moments of trepidation: After midnight, three young men near the ­Bromley-Heath housing development flag down the cab. One asks for a ride to Franklin Park — for a discount rate of $5. Refusing him could trigger a conflict, so the man is welcomed in. At Egleston Square, he changes his mind — and the driver’s pulse quickens. Now, the man wants to go to Grove Hall. Fares like this can lead to trouble, but this ride ends without incident, the man disappearing into the darkness. Over time, headaches develop as the cabbie’s back door opens and passengers come and go. There are drunks who want a pop radio station’s volume cranked to deafening levels. There are college students who use the taxi as a moving van. Their expectations are high — Driver, could you help us with these things? — and their tips are low. And there are fare evaders. Near the Museum of Science, a woman hops in, bound for the Prudential Center. She is pleasant despite a traffic jam that has choked Storrow Drive. She pays with a credit card, but moments after she has slipped out of the cab and melted into the sidewalk crowd, the computer flashes “unauthorized.’’ Her free ride costs her cabbie $13.20, more than an hour’s wages. Four nights later, it gets worse. At 12:30 a.m., with taxi business scarce, two security guards at Massachusetts General Hospital approach the cab. They are pushing a wheelchair carrying a disheveled man in a dirty hospital johnny. The man is headed for East Boston. He asks for a cigarette before the cab leaves. 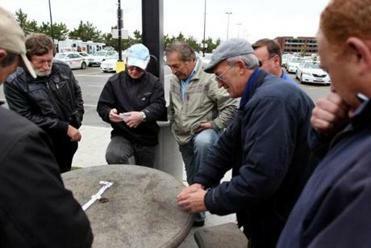 Boston cabbies are commonly criticized for spurning fares to East Boston, a destination dreaded for its $5.25 return toll. Taxis are permitted to assess a $2.75 surcharge for passengers traveling through the Callahan Tunnel to any location but the neighborhoods of East Boston. When the cab reaches Jeffries Point, the customer says he needs to go inside for his money. He returns smelling of liquor and says he is locked out. “Do you have a screwdriver?” he asks. He wants to break in. At the Maverick Square firehouse, several firefighters come to the door. They have seen the man before. “I know,’’ Richard, wobbling, replies. It’s back to Jeffries Point, Engine 9 trailed by Boston Cab 870. The firefighters jimmy open two doors and usher Richard into his apartment, but he can’t find the money. “It’s under the bed,’’ he says, cigarette smoldering. A firefighter lifts a filthy mattress. Nothing. It’s 1:15 a.m., and the driver, already deprived of about two hours of wages, cuts his losses. The reporter expects no sympathy at Boston Cab, where “the most important thing’’ is money in the drop box. After every shift, the reporter fills his gas tank at a station less than three blocks away. He pumps until the gas gurgles over, once onto his shoes. Yet when he reaches the garage one night, the gas attendant tells him he owes the company an additional $2.09. “How is that possible?’’ an attendant is asked, told about the overflowing gas tank. “It happens to everyone,’’ the attendant says, shrugging. The practice can be a boon for Boston Cab. If every driver pays an additional $1 for gas, for example, the company could possibly reap as much as $100,000 a year. Boston Cab also charges the $5 waiver to subsidize its self-insurance program. The Globe reporter purchased that insurance Nov. 4 hours before a motorist ran a red light at Stuart and Clarendon streets, totaling the 2011 Camry hybrid taxi he was driving. The cabbie and his two passengers are taken by ambulance to Tufts Medical Center. The passengers suffer facial injuries, the reporter a minor head injury. At 3:20 a.m., Boston Cab gets a call from the cabbie’s hospital bed, notifying the company of the accident. “I got the cab. It’s OK,” the manager said before abruptly hanging up. Days later, the driver severs his brief relationship with Boston’s biggest fleet. He returns to the basement garage and says he has had enough of the city’s crazy drivers. His security deposit is returned and he is told to keep in touch about accident-related issues. Seated nearby is Tutunjian, the former cabbie turned taxi tycoon. He is eating a sandwich and watching ESPN. He has heard the reporter explain why he is walking away. “Would you want to drive a cab out there today?’’ the reporter asks him. The king of Boston cabs makes only brief eye contact and turns back to his television. His lips move, but only to take another bite of his sandwich.